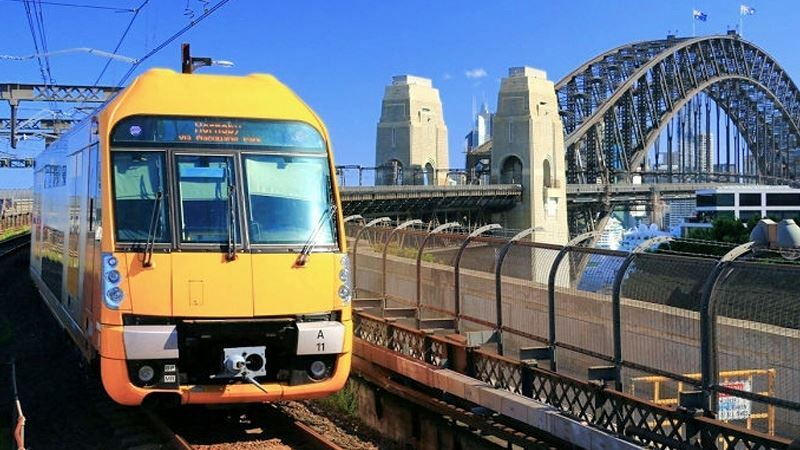 A new report from JLL predicts Sydney’s three major rail projects will have the biggest impact of any infrastructure projects on NSW property markets over the next six years, reports The Australian. According to JLL’s NSW economic growth drivers and infrastructure report, Sydney’s Light Rail (CBD and South East), Sydney Metro Northwest and Sydney Metro City and South West would have the biggest effect on both residential and commercial property sectors. “Infrastructure changes real estate markets,” said JLL’s head of research, Andrew Ballantyne. 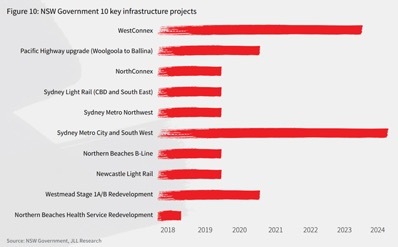 The report notes that infrastructure spending in NSW was at unprecedented levels, with the state government committed to delivering ten key projects in metro and regional areas by 2024. Strong population growth and under-investment in significant infrastructure projects following the 2000 Olympic Games provided the current catalyst to improve services and facilities across the state, JLL said. Properties close to Sydney’s Light Rail were likely to increase in value, while the mix of retailers and office tenants along the route was also expected to change. “George Street is going to become a more desirable location for retailers in the luxury and food-and-beverage categories,” said JLL’s NSW managing director Daniel Kernaghan. “Improved connectivity within the CBD will mean organisations can look beyond the core CBD to secure lower office rental rates. Average A-grade rents on Goulburn Street are 31 per cent lower than for comparable A-grade core CBD assets,” he added. The Sydney Metro is expected to help grow the North Sydney office market to about 930,000sq m of space by 2024 and revitalise Central Station, helping to regenerate the southern Sydney CBD. “Based on our assumptions of underlying demand, stock withdrawals and vacancy rates, Sydney will need 1.38 million square metres of new office space delivered by 2027,” Mr Kernaghan said. 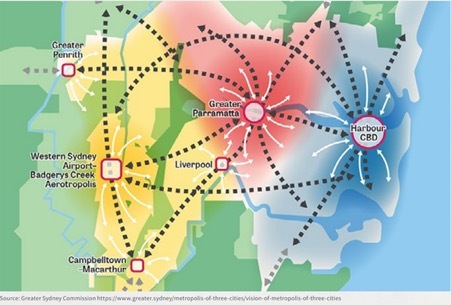 The report also notes the Greater Sydney Commission’s three-metropolis proposal would create opportunities for investors, developers and occupiers. For example, the Western Sydney Airport and Badgerys Creek Aerotropolis will drive growth in the western region of Sydney. “In Parramatta, the capital of the Central River City, the office market is expected to reach 1 million square metres of space by 2022 and 1.14 million by 2027,” Mr Kernaghan said.